The doctoral dissertation of Milja Vepsäläinen, M.Sc. 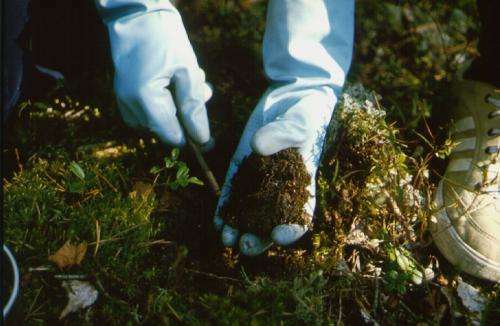 (microbiology), prepared at the Finnish Environment Institute, involved developing a test pattern designed to measure soil biological diversity. The aim is to measure the activity potential of enzymes produced by soil microbes. Enzymes regulate cycling of elements in soils, and measurement allows assessing the functional diversity of soils. In addition, the results may be used as an ecosystem indicator. Since very little data on the functional diversity of soils is available, there is a clear need for methods that enable the measurement of soil-related variables. The defence will be held on 9 November 2012, at 12 noon at Building of Forest Sciences on the Viikki Campus of the University of Helsinki. The soil microbial community contains a wide range of species and an immense number of microbial cells, and they carry out several types of reactions. One gram of soil may contain as many as 10x109 microbial cells; in comparison, the number of humans on Earth is 7x109. Since it is impossible to determine the number, richness, and structure of species, an alternative method for measuring the microbial diversity is to assess the type and rate of reactions mediated by soil enzymes. The objective of the dissertation was to develop a rapid and sensitive small-scale method for the simultaneous measurement of the activity of several soil enzymes. The method involves analysing homogenised soil suspensions using fluorescent substrate analogues freeze-dried onto multiwell plates. The feasibility of the enzyme activity assay was assessed by measuring soil samples obtained from experimental sites, treated in different ways, and supporting different cover plants. In addition, the effect of the season on the enzyme activities was studied. Bulk samples were obtained from experimental sites established in agricultural and forest soils. Eight different crop plants and added peat caused statistically significant changes in enzyme activity levels in two consecutive sampling years. The effect of crop plants was the most pronounced, and it was observed in eight of the ten enzymes measured in both years. The sampling year affected the activities of six enzymes. The effect of peat addition was detectable only after two years. In another experiment, green or composted plant residues were added to soil. This enhanced enzyme activities slightly compared to chemical fertilizers, but the effect was not consistent. When calculated on the basis of organic matter, forest soils showed higher enzyme activities than agricultural soils, and enzymes showed higher potential activity around alders than around pine trees. Cluster analysis was used for data analysis in order to combine the data for all measured parameters. Clustering allows for the grouping of samples, revealing differences in the entire pattern, even though the differences in individual enzymes were not statistically significant and even though the results showed correlation. The sophisticated cluster analysis software was developed at the Finnish Environment Institute in connection with this research project. Due to the diversity of species and the wide taxonomic diversity in soils, methodological development in soil microbiology is still a major challenge. A reference sample for comparison purposes is generally required for the interpretation of results. The method developed in this study may be used as a sensitive indicator of soil diversity. The experimental part of the study was conducted at the Laboratory of the Finnish Environment Institute with funding from Tekes, and the author wrote the analysis part as an external researcher at the Natural Environment Centre's Ecosystem Change Unit. More information: Functional biodiversity in soils - Development and applicability of an enzyme activity pattern measurement method.